Ms. Poepjes said music from “a popular part” of the regional anthem, “De Alde Friezen,” or “The Old Frisians,” from the 19th century, had been painted on. The project cost 80,000 euros, or about $99,000. Signs told drivers, “You are approaching a singing road.” When drivers hit 60 kilometers per hour, about 38 m.p.h., the regional anthem rang loud and clear. 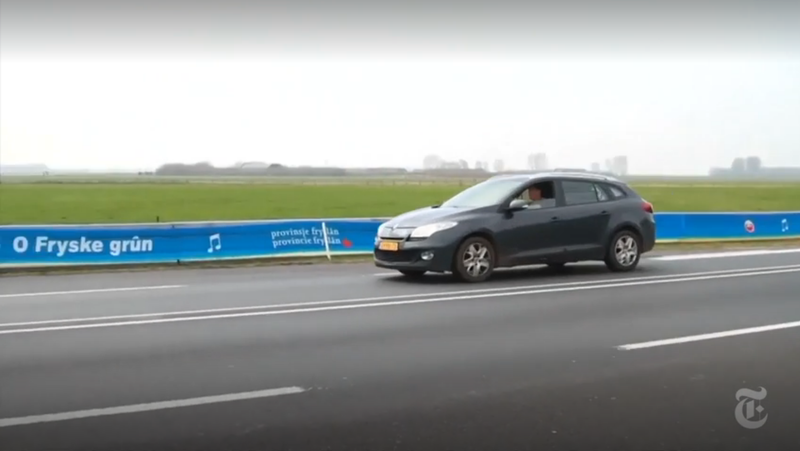 Sietske Poepjes, Vice Governor of the Friesland Province, visited the residents to hear the complaints, only to learn that the stunt had caused some motorists to intentionally speed up and aim for the song lines, not go the speed limit. Poepjes conceded that the project was a failure, and the noise-making paint lines were stripped off the road Wednesday night, just two days after being installed. According to the Times, the idea isn’t completely dead yet. Officials are still interested in installing similar, uh, cultural road instruments elsewhere. They’re just going to solicit public opinion before, and not after, this time. Correction: This post was live for approximately one minute with “Norway” instead of “the Netherlands” in the opening paragraph, but has been corrected. We’re super sorry.